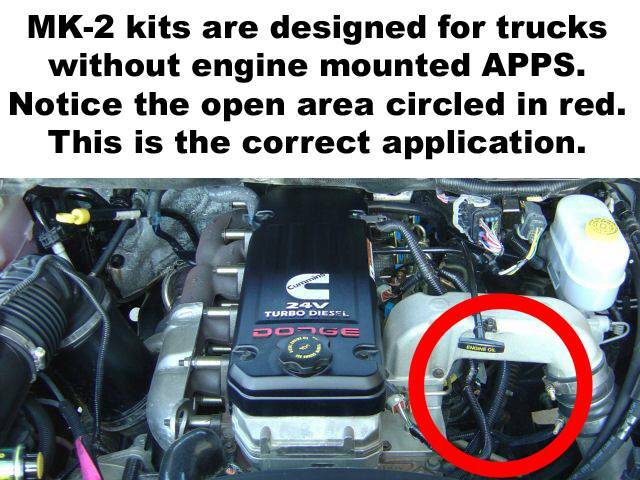 Now trucks with aftermarket intakes can take advantage of the MK-2+ system too!!! Bosch recommends it, your Common Rail fuel system demands it. The Micro-Kleen System delivers and now we've made it even better! 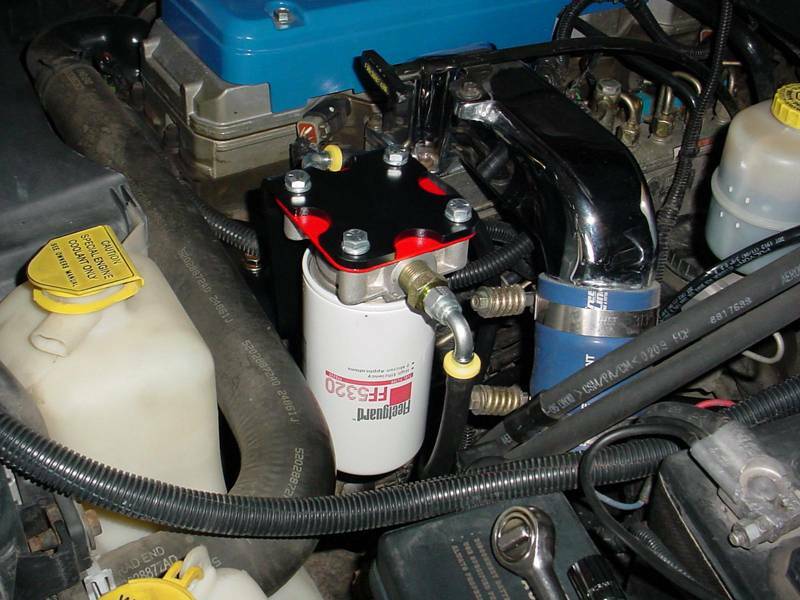 The MK-2 + CHMB (cylinder head mounting bracket) is the latest addition to the GDP MK-2 filter systems line-up. The MK-2 + CHMB allows installation of the GDP 2 micron filter system on '03-'07 5.9L Dodge Ram trucks running aftermarket intake manifolds. 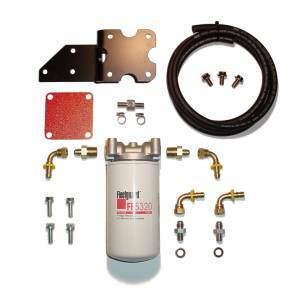 The MK-2+ CHMB System adds a high efficiency Fleetguard 2 micron filter between the stock fuel filter and your expensive injection pump. Our laser cut and CNC bent steel mounting bracket ensures a perfect fit everytime. 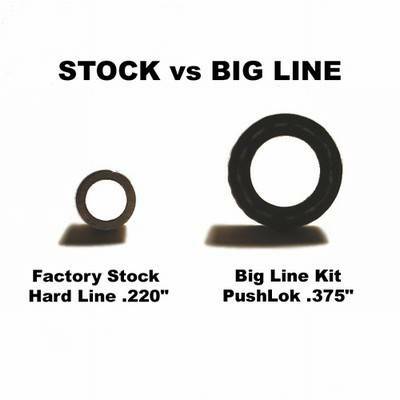 The Fleetguard FF5320 and 3/8" lines used in the MK-2+ will support any level of performance modifications. Flowing close to 100 GPH at a pressure differential of less than 1 psi the MK-2+ ensures no loss of performance while you reap the benefits of 2 micron filtration. 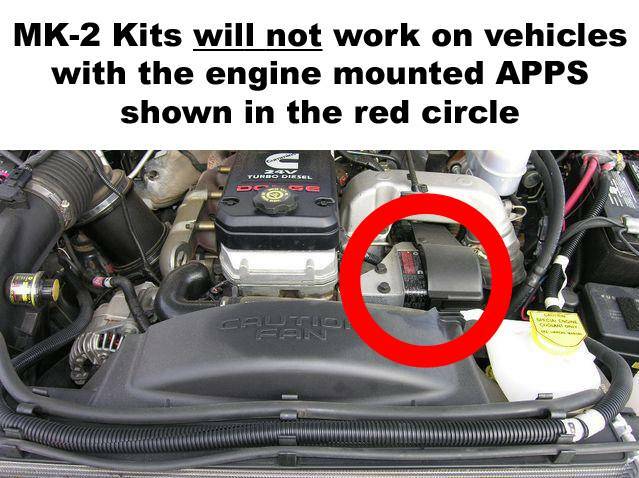 Note: The MK-2 System is not for use on trucks equipped with engine mounted APPS or Jacobs Exhaust Brakes. 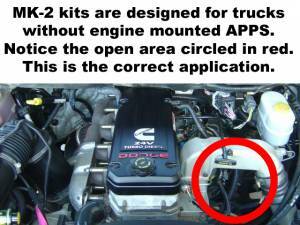 For trucks with engine mounted APPS please see our APPS specific kit. If you are in doubt about your application please review the pictures above. This kit was put together well. Easy to install with detailed instructions. Recommend cleaning threads on head, and changing stock fuel filter at the same time. This was a very well designed kit. Everything fit well and it also looks very neat/clean under the hood. I installed this kit along with new injectors and hope to give them a long life. In my opining you can't beat the quality and simplicity of this kit for the money. I'm very satisfied. Kit installed very easy. Everything you need is included. Instructions are very well done. Everything is high quality. The bracket that GDP includes is very heavy duty. The only issue I see is that I should have installed this on my truck when it was new. Friend of mine looked it all over and ordered one also. Thanks for a great product!!!! Put this kit on my truck when I bought it, 40k+ miles later its working great with no leaks and changing my fuel filters every other oil change. I strongly recommend ordering extra Fleetguard 255622S center orings!!! Because when I pulled the filter to change it out today the center oring was trashed, probably my fault for putting my filters on too tight. Easy to install and looks great under the hood. Awesome kit and set up. Went together easy and looks very professional, like it should have come from the factory this way! There are only two comments I would like to make. One being that its a good idea for anyone installing this kit to by a tap in order to chase the threads on your cylinder head. Since two of the holes on the head are not used from the factory they tend to get a bit of surface rust. The only other problem was that GDP did not include torque specs in their instructions. If they were to include that in future verisons this kit would be perfect. Overall this is a fantastic product! Would reccomend to all. Very easy to install, the directions are great and very detailed! The red plate looks great under the hood of my red truck. Thanks! My Cummins tech buddy installed my GDP 2-micron+ Big Line Kit for me and it came out great! Performance is the same and the stock pump, filled the two filters pronto. Excellent product, easy install. The mounting bracket is very stout and fits perfectly. The instructions are well written and easy to follow. This system is designed very well. Great Product and Easy Installation! I have driven about 1,000 miles on my 2007 5.9L Cummins after installing this kit from GDP and no issues whatsoever. It's a great product and the customer service was outstanding! It looks great under the hood and my friends have all commented on the fit and finish. I'm even more pleased knowing I have the extra filtration. Thank You GDP!